ABC Russian: Have you ever seen Soyembike? Have you ever seen Soyembike? Have you ever seen Soyembike? The leaning tower in Russia? In the beautiful city of Kazan you can find the so-called leaning tower which is called Сююмбике in Russian. 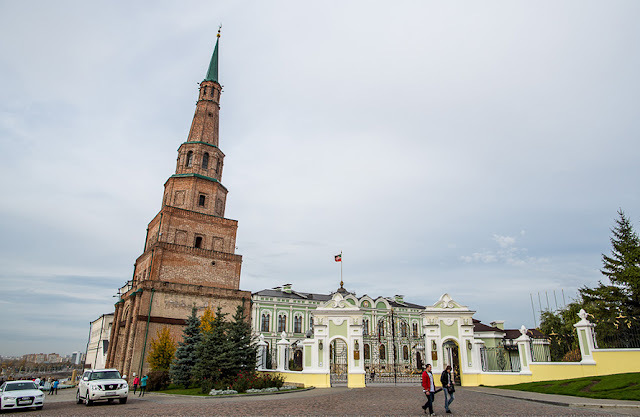 This is the part of the Kazan Kremlin and now it considered to be one of the most famous sightseeing in Kazan. The tower is 58 m high and its inclination was estimated at 1 meter and 98 centimeters. Diverse stabilization methods were used to straighten the tower in the 1930s and 1990s, and it no longer leans. There are a lot of mysterious stories and beautiful legends why the tower was built and who did this. The author of of the tower is still unknown. The tower's construction date is enshrouded in mystery as well. Some scientists date its construction to the 17th century, but others date the tower to the 16th century, probably before 1552. Watch video and practise your Russian listening skills!